After my Season Opener Pants post, I received several comments and lots of emails on pants. I posed a question on my Facebook page and asked you all what is the scariest/dreaded awful part about making pants for yourself was and several of you answered. So, I thought I would put my knowledge here in a post, that is due to be added to every now and then as I become aware of more and more awesome stuff about pants. Part of the pant conundrum with sewers/sewists (whichever you prefer) is knowing. Dontcha think? I mean, I remember when I made my very first pair of pants. This was after I had made a jacket, a well-fitting pencil skirt, dresses, even blouses. I was fresh out of college at the time and I made a pair of Vogue wide leg trousers right out of the envelope. They were awful! Yet, I still wore them because it was the principle of the thing, you know. Then it was time to get educated on how to fit pants and what's more, how to construct them. So here is an encyclopedic post on where to find the best info on pants. Here we go! Nothing strikes more fear into us than fitting a pair of pants! Am I right or am I right? Here's some resources for you. ● Pants for Real People - I love this book! If nothing else, it teaches you about the relationship between each of your three tubes (torso and legs) and teaches you how they interact. I've also heard really great things about their DVD's too. ● Here's another book to look at too. I don't actually own this book, but I've heard amazing things about it - Easy Guide to Sewing Pants. Apparently its chucked full of great fitting information and goes through the process of how to only fit one pair of pants but make several different design changes for a whole wardrobe of different pants from one pattern. ● I hosted a Trouser Sewalong a few years back and here is the link to all the posts (several fitting posts included) for it. If you're new to pants, check it out. Lots of great info there. ● Kenneth King offers a CD Book on how to draft (and fit) your own trousers. Though I myself haven't yet purchased it, I'm a huge fan of anything Mr. King does - his Threads articles are simply marvelous. Check it out! Additionally, there was a recent article - that applies to many of us - on this particular pattern alteration, how to fix a baggy seat. ● Sandra Betzina has a Craftsy class on how to fit pants. Tell me, what could be better than being able to see someone, who knows a bundle about sewing and fitting, actually teach you how to fit pants? Nothing. Sometimes even though we've tried every trick in the book, we still can't seem to get the fit we want. Here's another idea for you. ● Try a rub-off of a favorite pair of pants. A rub-off is the process of creating a sewing pattern from an existing garment. Rubbing off a pattern from a favorite RTW garment is not terribly hard to do (in fact pretty easy!) and its something that I think should be utilized more. Patternmaking for a Perfect Fit is a great and affordable book on the subject. This book doesn't actually walk you through the process of rubbing off a pair of pants, but she shows just about everything else. You'll get the idea and learn how to to do more types of garments than what is shown in the book. Also, Kenneth King's Craftsy course Jean-ius! is another way of doing this - he'll walk you through all the ins and outs on an actual pair of pants. A lot of people dread the fly front. 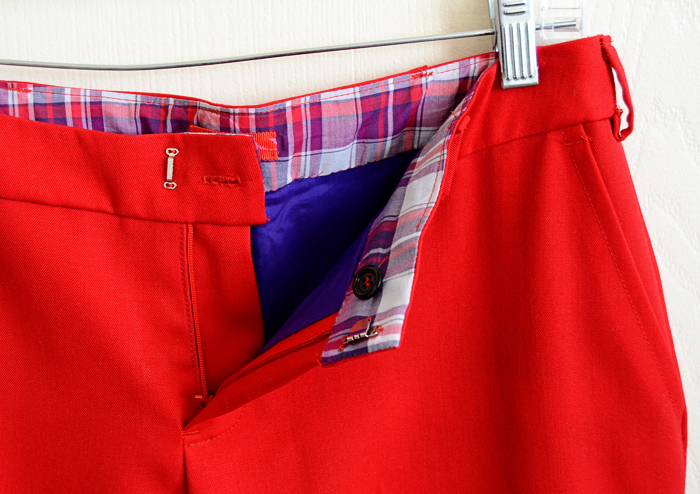 Many have questions on how to line a pair of pants and how to make welt pockets. Here's some construction resources, especially for pants, just for you. ● My absolute favorite fly front zipper tutorial (Debbie you are a genius!) - please note that I interface my entire fly front area. I firmly, firmly believe that all zipper openings should be stabilized - my own personal opinion - and fly fronts are no different. Here's a link to another video tutorial by Sandra Betzina - she stabilizes her fly fronts too. Both tutorials are EXCELLENT and make the task of putting in a fly zip actually kind of fun. ● I think Connie Long's book on Easy Guide to Sewing Linings is the best kept secret in the sewing universe. (By the way, the link here is to the very affordable e-book - buy it right up!) In this book, she takes you through every type of lining situation including how to line a pair of pants with a fly front - it is awesome, it is marvelous, miraculous and stupendous. If you like lined garments, this book is a MUST have! ●Welt pockets are not hard. Just time consuming and they take a good amount of prep work. These two tutorials from Fashion Incubator are excellent - single welt pockets & double welt pockets! ● Sandra Betzina (this woman knows her pants, eh?) also has a Craftsy course on pants construction. So in addition to the fitting series, there is the construction series. Starting with a good sewing pattern is really almost half the battle, right? Personally, I feel now, that you should go for a pants pattern that has all the elements you want. From there you can change design elements on the pants to make different styles. Here's a few of my recommendations. ● I've had pretty good luck with Burda patterns. Their pants block (the block from which all the patterns are drafted) is excellent for my shape. This may not be true for everyone else. 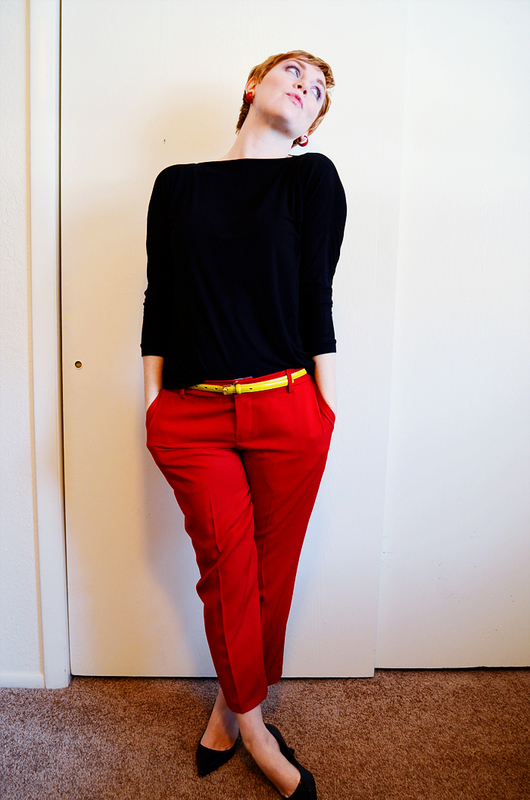 ● Sewaholic's Thurlow Trouser is another one to try. I've not actually tried them myself yet - will soon though - but I've had a couple of students use this pattern in my Pant Fitting class. Its impeccably drafted and I'm fan of some of the different elements that Tasia has included. Also, you don't have to be pear shaped to use this pattern - I'm not and I've used several of her patterns all with success. ● Simplicity's Amazing Fit patterns are actually pretty amazing. I've had a few students bring these to my pants fitting class and I'm actually quite impressed with how well these have fit a variety of shapes right out of the envelope. They usually include the fit for 3 different body shape types and if you look at their dresses and tops, they include different bust sizes - AWESOME! Be aware that you do need to read the instructions for these patterns - they have a different way of measuring for finding out whether you are curvy, average or slender and they include 1 inch seam allowances in certain strategic places. ● If you're up to it, you can draft your own. I'm a big fan of Building Patterns, which is a great book on how to draft all manner of women's clothing. Fairly affordable too, especially as compared to many other drafting books. Well friends, I do hope this gives you some idea as to where to look for ideas and help on pants. For those of you who are already pant masters, what are some of your resources/recommendations? Care to share? I look forward to the pants discussion. That part that scares me is altering the crotch. Even though I know how to do it theoretically, it's the part that intimidates me. Silhouette Patterns has great webcasts for fitting. What a great summary of trouser/pants info. Thank you for putting that together. I am bookmarking it for when I get round to making some trousers. 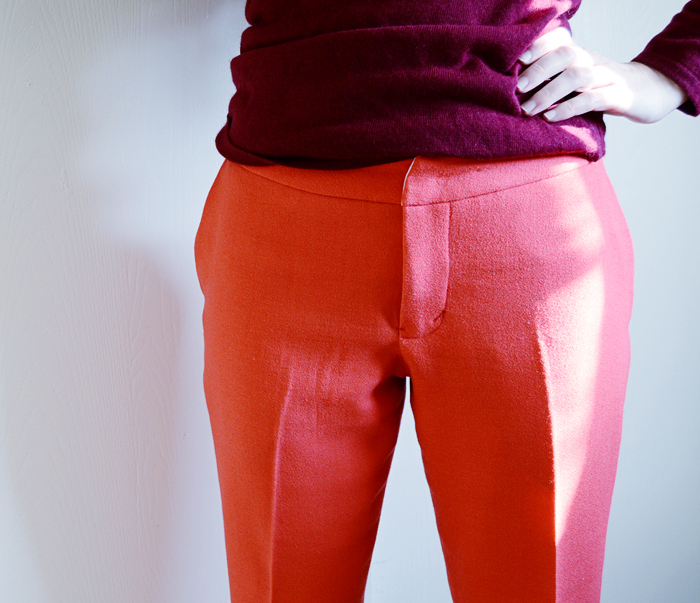 I made 2 pairs of trousers when I was a teenager, without a second thought - and half lined them! Having read lots of blog posts about making trousers I am approaching the thought with alot more trepidation! Peggy sager silhouettes has great info on pant fitting. She also came out on its sew easy season 2 with pant fitting problems and how to fix them. The singer series pants book is a great one. It has great picture for what to look for and how to fix plus how to sew them up. Thanks for the info. This is great! I was hoping there would be enough interest for you to put this list together. I still haven't sewn a pair of pants, but it is on my to do list this year. This is will be immensely helpful when the time comes :) Thanks so much!! Thanks so much for this! I shall definitely be checking some - if not all - of your recommendations out. I plan to make my first trousers this year, hopefully sooner rather than later! I ordered Burda 7447. I am finishing up the project I am working on now so when the pattern comes I can get right to my muslin. No more putting off making pants! I have made 2 pairs of Burda shorts before and the fit was good so I am hoping this pattern will work for me. Thanks for all this information. Thank you so much for these great resources. I got lucky with the fit on my first pair of Clovers, so I want to keep up that happy momentum and move forward. I started making pants because I couldn't find any RTW that fit me, so I can't go the rub off route. I agree with you about Debbie's zip fly tutorial, it's the best. I shall have to look at the lining book, that's the least satisfactory part of my latest project. Great list of resources! weirdly i was reading through all of your trouser sewalong posts last night as i'm about to start on a pair of junipers - my resolution this year is to make a well fitting pair of trousers. i couldn't work out even where to start and your posts were a great help! trouser muslin here i come! I love Clover from Colette Patterns, It seems drafted for me! It is easy to sew, good for beginners and not too many pieces. Thanks for all the information! Sunni, thank you for this post, what a great resource! I just looked up and found a bunch of those books at my local libraries. It's so good to be able to sew something that I wear all the time, not like fancy dresses. I almost always wear pants but I have a lot of challenging fitting issues that make off-the-rack pants uncomfortable at best. I've learned to favor pants that are made to be roomy through the hips while still being small enough for my waist. Styles like cargo pants and palazzo pants as well as wide-leg trousers have generally gotten me "close enough." But now that I've started to get into sewing and fitting I feel like I can finally start to wear pants that truly fit. I made a couple pairs of wide leg trousers that went really well, as well as some yoga pants and now that I have things like the rise and waist fitting sorted, I'm starting to look at slimmer pants. The muslin I made from a burda pattern, this weekend, couldn't be pulled up past my knees. I need to add about 2" to the side seams to make them big enough in the thighs. The waist was actually a little big. So I'm definitely not burda shape, out of the box but that's ok, I'll get the pattern in order with a bit of adjusting. Thanks for all this info! It's so nice to have so many great resources all in one place! THANK YOU for this post!!! I am terrified of making pants, but it is on my goal list for the year. I am taking a pant fitting class on Craftsy, so hopefully the class paired with this list will help me! Sunni, thankyou for this amazingly generous post! I am still terrified of pants but I'm sure it will come in handy one day. In fact I have a 50s playsuit I made up on a whim, and that's a whole other fitting issue...I'm sure some of these resources will help me fix the baggy bottom. Thank you so much for this post! I still have more learning to do before I get to pants. But your post today is encouraging me to build up my sewing skills so that I can make some pants one day. What a great overview! I'll be sure to come back to this post when I'm starting my trousers soon. A big thank you for such a useful post. Thank you so much for this excellent post, Sunni! I'm about to start my first muslin for a pair of Thurlow trousers, so this is going to be super useful for me! Thanks so much for posting it. P.S. I received my first purchase from your shop and I love my chalk pen! Great article and so true, fitting pants perfectly has always been a frustration, especially when I try to fit myself, for some reason it seems easier to fit someone else & yet you'd think I'd know my own silhouette better! Great resource suggestions, I'm going to check them out, again thank you! Thank you so much for this post. It is very helpful. I just bought an Amazing Fit pattern and am currently working on it. Thank you so much for putting this together. I so want to sew a pair of pants - once I do that, I'll know I can conquer anything! One of my biggest problems is finding the right weight fabric for pants. I live in Florida so it's pretty hot almost all year round and I have to order most of my fabric online. This is some great info, thank you for doing the research! You are definitely inspiring me to make some pants! 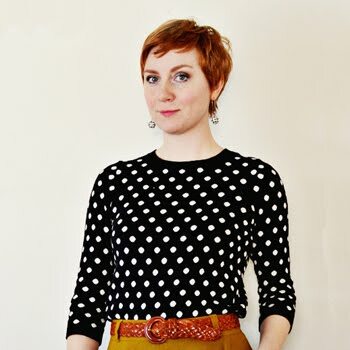 Don't forget the Thurlow sew-along hosted by Lladybird! I followed it and it was amazing! I've made two pairs now and the fit is great- I wear my pants/shorts quite low and am not pear shaped (as the bodies they imply the pattern is meant for)and the pattern still works out like a charm with very little adjustment. Thanks for this post!